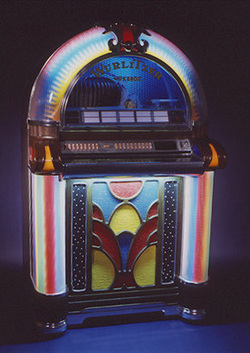 1973 Wurlitzer Model 1050 "Nostalgic" Jukebox. A reinterpretation of the amazing machines of the 1940's. The last American Wurlitzer to be produced prior to the company's demise in 1974. Trying to recapture the glory days of the Golden Age, alas it was not to be and under 2,000 of these extraordinary machines were produced. Height 58", Width 36", Depth 39"
Shipping charges and insurance are the responsibility of the purchaser. We will band to a pallet at no additional cost. The purchaser may utilize our freight discounts.